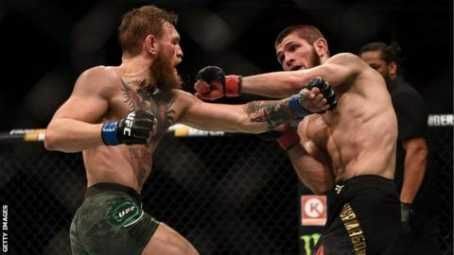 Conor McGregor has been suspended for six months and Fined $50,000 for his part in the brawl after his defeat to Khabib Nurmagomedov at UFC 229 in October last year. UFC lightweight champion Khabib has been suspended for nine months and fined £380,950 for his role in the incident of the Las Vegas fight. After forcing McGregor to tap out in the fourth round, Khabib climbed over the octagon and scuffled with fighter Dillon Danisin McGregor's corner causing a brawl to break out. McGregor was then involved in abust-up in the octagon with one of Khabib's team members with the Russian then escorted out ofthe arena by police as fans threw objects at him. Both suspensions have been backdated to the date of the bout - October 6, 2018 - after thepair were suspended following the fight. Khabib's ban will be reduced by three months if he participates with Las Vegas police in an anti-bullying public service announcement. His fine will be taken from his share of the UFC 229 purse, according to the terms approved by the Nevada State Athletic Commission. Neither McGregor nor Khabib attended the hearing and the champion tweeted shortly after the punishments were given:"Politics forever". Khabib's cousin and fighter Abubakar Nurmagomedov and another Khabib team-mate, Zubaira Tukhugov, both received 12-month bans and £19,025 fines for their parts in the melee.